Four week sessions. Meets Mondays 6-7 pm. Cost for 4 week session is $80. Payment can be made via PayPal. Please email instructor directly to register or with any questions you have. This 4 week session is for continuing students. Students will begin learning fundamental postures of aerial silks; including climbs, locks, holds, and transitions, to safely build a strong foundation in aerial arts. 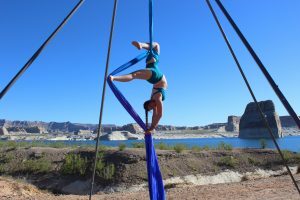 Each class will include strength and flexibility exercises specific to aerial training and time to build aerial vocabulary exploring poses and variations, transitions, and aerial silks choreography/sequencing. Class is open to all levels and assumes students have some previous aerial experience. Please contact instructor for more information on class level placement. Dress comfortably in athletic clothing that cover the backs of your knees. Class size is limited to ensure instructor can individualize curriculum so each student is appropriately challenged.